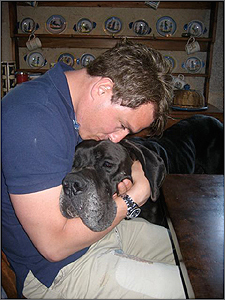 In 2007, John hosted Keys To The Castle for America's HGTV Channel, touring four English castles and exploring their histories. He followed this up in 2008 by going to France to visit four chateaux in Normandy and the Loire Valley. 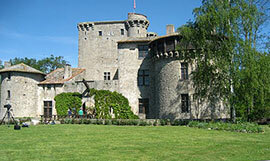 These pictures were taken at the 14th Century Chateau de Tennessus. John and his manager, Gavin, were the guests of the Freeland family and had a wonderful time making new friends. As you can see, John was also happy to get to know the canine members of the household!